You've never had a big block muscle car with worn out rear springs and white letter or white wall tires huh? Here's some other ideas for cutting BTW. Lol... The only time I've really given tires with lines in them a close look is while I'm at my dad's work (Cadi Dealership) and have noticed that on the Vogue tires, it's cut into the side wall for the color. I always figured they cut the sidewall to easily lay down paint while the tire is being produced. Never gave it much thought though. 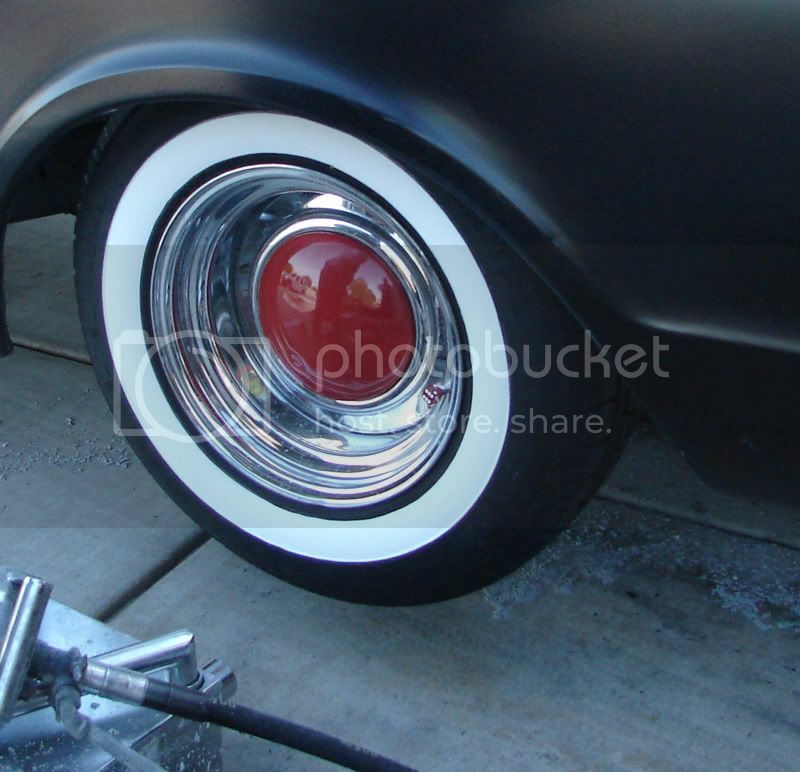 How narrow of a whitewall can this guy do?I need a set of 275/60s with narrow whitewalls. Something like this one Tim? I don't recall who this one belongs to but they are Hankook tires. Houp, those look great! Whats the wheel/tire specs. Looks to me like 15" X 8" with 235/75 tire, but whats the backspace on the wheel. Oh BTW any shots of the truck with the new meats. Last edited by stepn67; 03-23-2009 at 11:35 AM. These are buffed tires in Alb. New Mexico $15.00 each. Last edited by 65panelrat; 03-23-2009 at 12:47 PM. Welcome to the site! Coker, Diamond Back and couple others do the WWW's, redlines, etc, but they are a little pricey. Cutting them is a po man's way of doing them. Can't wait to see your thread. What are you working on? Trust me....I understand going the po man's route. I recently bought a 1969 C10 LWB, and a 2001 GMC Yukon XL. My goal is to become Dr. Frankenstein. I'm planning on putting the 69 body on the 01 chassis. 5.3L 2WD auto, 4 wheel disc brakes, ABS, TCS, etc. I guess I should quit hi-jacking this thread and go start my own. Thanks for the welcome! Way cool, thanks so much for posting. Man I wish I could find one of those machines! Thats so awesome! All I have ever seen is some hacked up jobs, and his looks perfect! That really is a lost art. 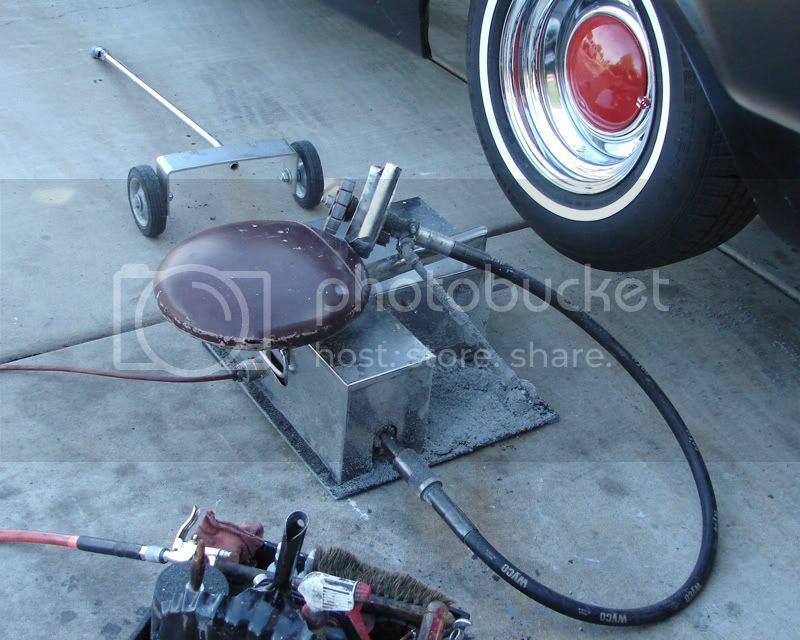 The first tire-balancing machine I ever saw was an "on-the-car" spinner machine, in about 1960 - 62 or so, at an old-style everybody-comes-a-runnin' when the drive bell rings style Mobil gas station. Looked an awful lot like that ole boy's spinner machine. Wonder if there's still any of those old spinner machines around. Probably somewhere. I'd think you could also use one of the new tire balancers, maybe with a rheostat or something in the circuit to slow it down just a bit. Looks like a new spin-balancer machine in the first one of the "other style" photos above. I didn't share this when I had them done so.... a little late but it made it. Long story short, I bought some "port-o-walls" and they flung off in less than 1 mile. A friend of mine at Discount told me there used to be a guy that came around and "cut" your tires to make white walls, so he gave me his number and said, he didn't know if he was still alive...... because he was "up there" when he came to the discount shops. So I called and sure enough (licky for me) he is still alive and kickin', but due to his age, 75, and two replace knee's and one hip, he can't get around so I need to come to his house. 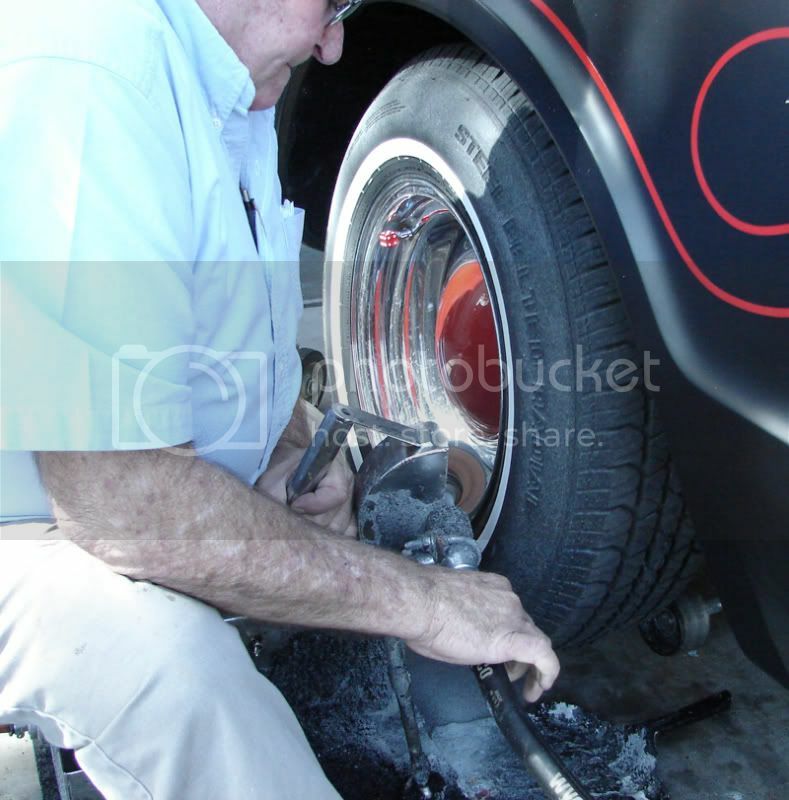 So I get there, we chat a little, then he pulls out magazine after magazine with him featured in articles "cutting" tires... from the original Bat mobile, one of Al Capone's original cars (being restored) and countless other vehicles. He not only "cuts" tires, he can also paint a red, white or gold thin stripe around the tire, he use's a really cool/innovative machine. 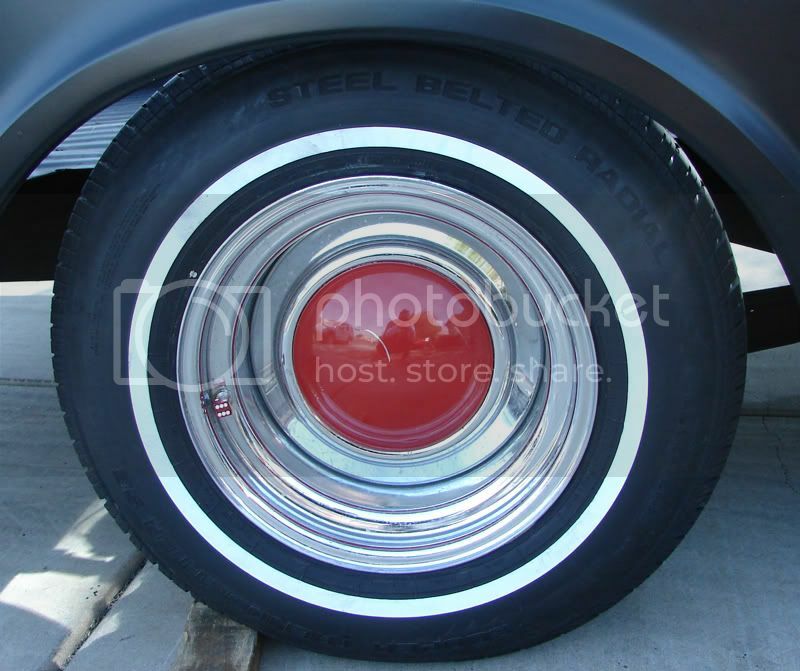 So, here are the photos, post up and let me know what you think.... Oh, he only charges $30 a tire! Come and meet us this weekend. We'll have a space showcasing some of the work we do. If you haven't seen our web page, please visit and leave your contact if you would like someone to call you to schedule your appointment for your tire enhancements.